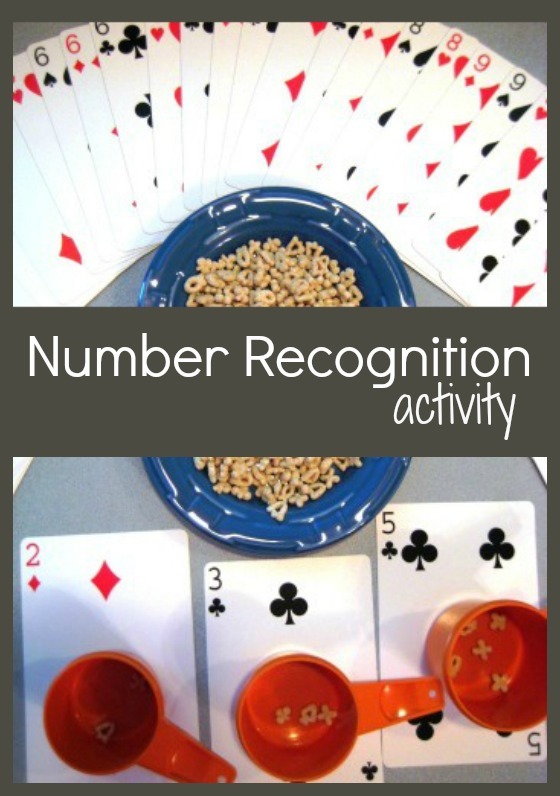 Introduce preschool children to number recognition using cereal, cards, and bowls. This simple number recognition activity also introduces one-to-one correspondence and addition to preschoolers. Little bowls and cereal appeal to tiny fingers and provide opportunities for your preschool-aged children to build math skills at home. As with this activity, adding math into other areas of playtime is easy. Math can be paired with movement like in this hopscotch addition activity or become a perfect quiet time activity with this pattern bead box. Pull numbered cards out of a deck to use, and place the bowls in front of your child. Place cereal in a small, easy to reach pile on a plate. Begin by placing a bowl on a number two card. Have your child count out two pieces of cereal into the bowl. Do the same with a number three and a number five card. After these three rounds, return the cereal to the plate and the cards to the deck. Then, have your child draw three cards from the deck and identify the numbers. Place the cards under the bowls, and instruct your child to count out cereal to match the numbers on the cards, placing one piece of cereal at a time into the bowl. Have your child count all pieces of cereal to find the sum. Encourage your child to continue practicing one-to-one correspondence by counting as high as he can!